Thursday, 10 April 2014 11:31 a.m.
Subject: Has Sir Eion Edgar paid his $1 million donation? You will recall the reports in The Mirror (10/7/13 – copied below) where you promised to honour your $1 million pledge initially reported in DScene (13/5/09). As there had been no public reports of you having paid up I decided a few months ago to make an official request under LGOIMA to see if this money had been received. After repeated requests for the Dunedin City Council to respond to my request I have received no response. I thought before making a complaint to the Office of the Ombudsman I would ask you directly if you have paid up. It is in the public interest that this pledge is honoured as it formed part of the push for the decision for the stadium to go ahead. You may also recall the report on the front page of the ODT (March 2007) where Mr Malcolm Farry announced “very excitedly” that he had a one million dollar donation for stadium construction with another two “in the wings”. This was also reported in the National Business Review. 1. Mr Malcolm Farry announces three $1m donations for stadium construction in March 2007. 2. The Marketing Bureau, commissioned by Carisbrook Stadium Trust, tells Dunedin City Council in Dec 2007 that naming rights are worth over $10m. 3. ODT reports Sir Eion Edgar becomes trustee of CST in August 2008. 4. Edgar and Farry announce Forsyth Barr have signed a Heads of Agreement in Jan 2009 and it is reported in NBR that a “substantial cheque” has been signed. 5. Council documents of cashflow projections, peer reviewed by PwC in Feb 2009, show that the naming rights payments have changed from full payment up front to two years in advance – “front-end loading” is the term for this. 6. Edgar announces in DScene in May 2009 he is making a $1m donation to the stadium. 7. Nine changes, as revealed in LGOIMA response from DVML, are made to the Forsyth Barr naming rights agreement then the contract is signed on 2 August 2011…the day after stadium opens. One of the final changes is from yearly in arrears to monthly in arrears. 8. Forsyth Barr makes their first payment on 1 September 2011. They are paying monthly in arrears. 9. Edgar, through Forsyth Barr lawyer in Oct 2012, denies having stated that Forsyth Barr had written a “substantial cheque”. The NBR journalist distinctly remembers the “substantial cheque” comment being made. However, no correction sought from NBR at the time. 10. The naming rights contract is no more than $5m as revealed in 2013 through LGOIMA request to DVML. 11. Edgar claims his $1m donation is part of the naming rights corporate contract in The Mirror in July 2013. The $1m donation still unpaid. None of the other three $1m donations for construction have been paid. 12. Michael Sidey is paying $1 million as part of the Forsyth Barr naming rights. I think what is happening is “double-counting”. Announcing million dollar donations for construction then two of these donations form part of the corporate contract for naming rights. Either [the] two $1 million payments are donations and the naming rights is only $3m, or the naming rights is $5m and the two [$1 million] donations don’t exist. You can’t have it both ways. This “double-counting” trick is what happened in the STS High Court injunction case where they claimed the $15m grant from Central Government was to offset the private funding shortfall AND was also used to offset the increase in land costs. This “double-counting” trick was established in the Court of Appeal. So, Sir Eion, have you paid the $1 million donation initially pledged for construction of the stadium? If you have paid $1 million as part of the Forsyth Barr naming rights then good on you. That’s between you and the corporate contract signed by Forsyth Barr. I’m sure Forsyth Barr are happy about that. What is of interest to the public is have you paid the $1 million donation pledged in DScene? As Chairman/Trustee of a number of Charitable Trusts you will be aware of the definition of a donation as recorded on the Charities Commission website. It bears no similarity to a corporate contract. I have copied Charlotte Henley, Forsyth Barr’s lawyer, into this email so she can confirm this definition, in case you still have any doubts. I hereby reserve all my rights. Copied to other interest[ed] media and parties. 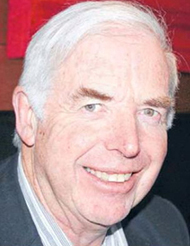 COMMUNITY-MINDED Queenstown-based businessman Eion Edgar, who retired as New Zealand Olympic Committee president last week and left a $1 million donation, on his support for knighthoods, backing Blis and why he’s not slowing down. KUDOS to Dunedin’s Bev Butler for putting the pressure on !!! Stadium opponent Bev Butler has urged Local Government Minister Nick Smith to initiate a full inquiry into the project. Butler believed an inquiry would prove it simply too expensive to maintain empty and unused. Confidential documents obtained through the Local Government Official Information and Meetings Act (LGOIMA) solidify Butler’s determination. She was heartened by the Dunedin City Council decision two weeks ago to commission a review of stadium completion figures by a PricewaterhouseCoopers forensic auditing team. But that wasn’t enough, she said. [In brief] Dunedin City Council (DCC) has called for the last rites to be said over Stop The Stadium (STS), and applied to have the incorporated society liquidated. The DCC said STS was insolvent, and unable to pay the remaining $9,860.91 court costs owing after STS lost stadium legal battles between the two organisations last year. The application is due to be heard on August 30. STS chairman Dave Witherow said there was nothing fair about the move and STS would defend the action.